FAYETTEVILLE, Ark. 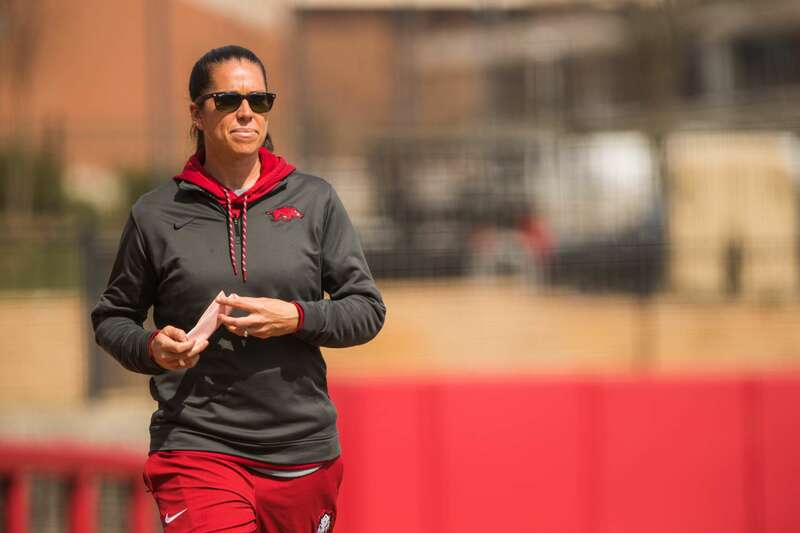 – Featuring a top-50 addition, head coach Courtney Deifel and the University of Arkansas softball team has announced the program’s 2019 signing class. The newest group of Razorbacks are Jenna Bloom, Paloma Usquiano and Rylin Hedgecock. This marks Arkansas’ fourth recruiting class under coach Deifel as Bloom is the latest top-100 recruit to come to Fayetteville. She will be joining future teammates Larissa Cesena, Taylor Greene, Mary Haff and Autumn Storms who were all ranked in their respective classes. A standout performer for Edison High School and the Athletics Mercado travel ball team, Bloom is ranked No. 43 in the final FloSoftball Hot 100. During last season’s state tournament run, Bloom struck out 24 batters in 12.1 innings of play while allowing just one earned run while leading Edison HS to its first playoff win in two years. Against the nationally-ranked Mission Viejo High School in Edison’s season opener last spring, Bloom dominated, striking out 15 batters while allowing just one hit in a 10-0 win. The five-inning game saw every out be recorded via a Bloom strikeout. She finished last season with a 6-4 record while splitting time at pitcher. Jenna is the daughter of Daniel and Melonie Bloom and has one brother, Jacob. Her mother, Melonie, played volleyball for San Diego State from 1992-97. Usquiano helped lead Orange Lutheran High School to a 26-5 record last season, that included a tournament win in the Dave Kops Tournament of Champions against third-ranked Los Alamitos High School. She also lead the team to the Torrance National Tournament championships; a tournament that features the top softball teams from California, Arizona, Utah and Nevada. Usquiano has batted over .350 in each of her sophomore and junior seasons, including a .435 average during her sophomore campaign. As a member of the So Cal Athletics Jendro travel ball team, she has been equally consistent, owning a .350 and a .360 batting average during her sophomore and junior seasons, respectively. Paloma is the daughter of Armando and Dianna Usquiano and has two sisters, Sofia and Julietta. During her high school career, Hedgecock posted a 1.1 ERA in each of the last two seasons. She holds the school record for career strikeouts with 500. Hedgecock has led Lowndes High School to two Region Championships, including a fifth-place finish in the state tournament during her sophomore campaign. As a batter, she has posted 11 or more home runs in a season three times, including a career-high 13 home runs and 49 RBI her sophomore year. She has batted over .400 each season with Lowndes HS, including a .549 mark last season, with 12 homers and 43 RBI. Hedgecock plays travel ball for Gainesville Gold. Rylin is the daughter of Russ Hedgecock and Heather Prince. She has three siblings: Tori, Bryson, and Savannah.